As someone who gets itchy (green) thumbs around mid-winter, PlanGarden sounds like my dream software. 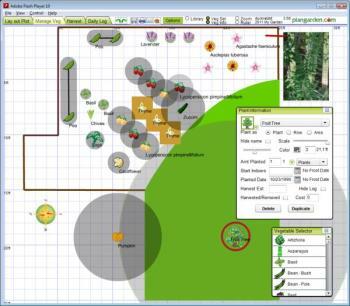 Starting with a plot size as large as five acres, you can use PlanGarden ($20, limited demo) to draw your envisioned garden beds, lay out all of your imagined plants including plant spacings, set frost dates and indoor starting dates, and start a daily PlanGarden log. When you're ready to plant, use PlanGarden to track varieties, amount planted (by plant, row, or area), date planted, and estimated days to harvest. PlanGarden has a harvest log too, so you can track how much you gather from each plant. Unfortunately, overly basic features and a clumsy interface make PlanGarden somewhat less than dreamy. Enable plant spacing to see the space each plant will need in your garden, one of the best planning features of PlanGarden. Use PlanGarden's daily log entries to track actions in the broad categories of Bug, Compost, Fertilize, Greenhouse, Herbicide, Miscellaneous, Pesticide, Soil work, Weather, and Weed, and apply these to your garden overall or the individual plants or plant areas you've included on your PlanGarden plan. You can't add images to your log, but fortunately you can add a written description and can pre- and post date items. PlanGarden does have annoyances: you can't track production from individual plants in a row, or draw a garden bed that curves inwards; and there's no easy way of diagramming shadows. You can add photographs in PlanGarden's Plot Layout tab, but you can't easily link them to your plants in the Manage Veg tab. PlanGarden works online through any browser and no download. If you choose to download PlanGarden, you still need to be online to save your work, so the download is useful only if you have a slow or intermittent internet connection. When offline, PlanGarden runs in Adobe Flash Player, and shows up as Flash on the program header and when you minimize, which makes it hard to find if you have numerous programs running at once. You can create a garden blog through PlanGarden, use a widget to publish your plan online, and even create a .PNG image of your garden. But this seems disappointingly ancillary to the main PlanGarden program. For example, you can't publish PlanGarden log entries as blog entries. Overall, I'd say that there are better and more intuitive ways to track your planting dates and harvest than PlanGarden--a free drawing program like Tux Paint, a simple spreadsheet like OpenOffice.org's free Calc, and a blog would save you $20 per year and would likely leave you less frustrated. For tracking really detailed plant information like germination rates or fertilizer use, try MyGardenBytes, a free program designed for hydroponics that also works great for a small scale conventional garden, or the $60 Garden Tracker. Although PlanGarden is easy to use, some of the features are hard to find and it's a little too basic for a serious gardener who wants to track and chart particular details.